In March of 2008, Devon Energy Corp. officials stirred the interest and imaginations of Oklahoma City residents with the announced construction of a new Devon Tower, what would be the metro's tallest building. But when the official Devon Energy Center plans were finally revealed on August 20, 2008, the response was absolute awe. 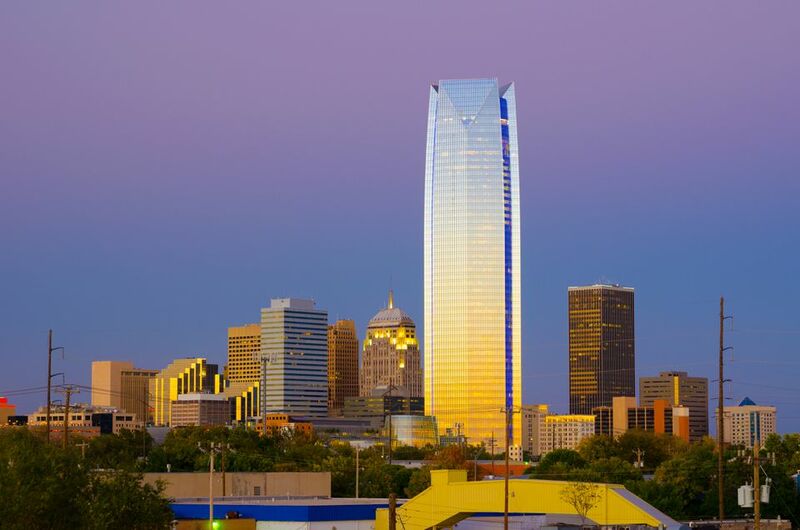 Instead of edging just above the rest of the Oklahoma City skyline, the glass Devon Tower is quite a sight to behold, rising far above the rest of the metro and reaching the sky in a representation of the tremendous renaissance of our fair city. Here is all the information you need to know about the Devon Tower, its construction and more. Designers: Pickard Chilton Architects Inc.
How does its size compare to other buildings in Oklahoma City and elsewhere? Frankly, the 844-foot structure dwarfs the rest of the downtown buildings from some angles. Cotter Ranch Tower, previously our tallest, has 36 floors and sits right at 500 feet. The First National Tower, built in 1931, is 446 feet tall. In addition, the Devon Tower holds the title as the tallest in the state, besting Tulsa's 667-foot BOK Tower, and it ranks with the tallest skyscrapers west of the Mississippi, just short of Dallas' two tallest, Bank of America Plaza and Renaissance Tower. On a national level, it ranks in the top 50. The 3-sided glass tower features diamond-shaped faces at the top, a 100' by 100' glass rotunda just beside it and a six-story "podium" stretching to west Hudson. The "podium" has auditoriums, classrooms, and offices. Reflecting pools sit at the base of the tower, and a transparent wall allows those passing by to see into the tower lobby. Each floor has 25,000 to 28,000 square feet, collectively housing up to 3,000 Devon Energy Corp. employees, consultants, and contractors. Designers emphasized, however, that they wanted the ground level of the structure to be the "heart of downtown," a place for the public to gather at restaurants and shops. For example, Nebu is the casual food court and dining area in the garden wing. It includes a wide array of options such as sandwiches, pizza, sushi, salad, and gourmet Italian coffees, and it is open to the public, not just Devon employees. What about the top floor restaurant? The full-service restaurant Vast occupies the tower's top two floors, with seating for 135 as well as private rooms, and it offers, quite obviously, some incredible views. One of the metro's must-visit restaurants, it opened in October of 2012. What kind of food does Vast serve, and how much does it cost? A fine dining concept from Skirvin Hotel chef Andrew Black, the menu features American fare such as steaks and seafood, and while one might assume prices would far eclipse other high-end metro restaurants, officials say that isn't the case. In an OKCBiz article prior to the restaurant's opening, food and beverage operations head John Williams is quoted as saying, "We are not going to overprice the market just because we're at the top of the building."